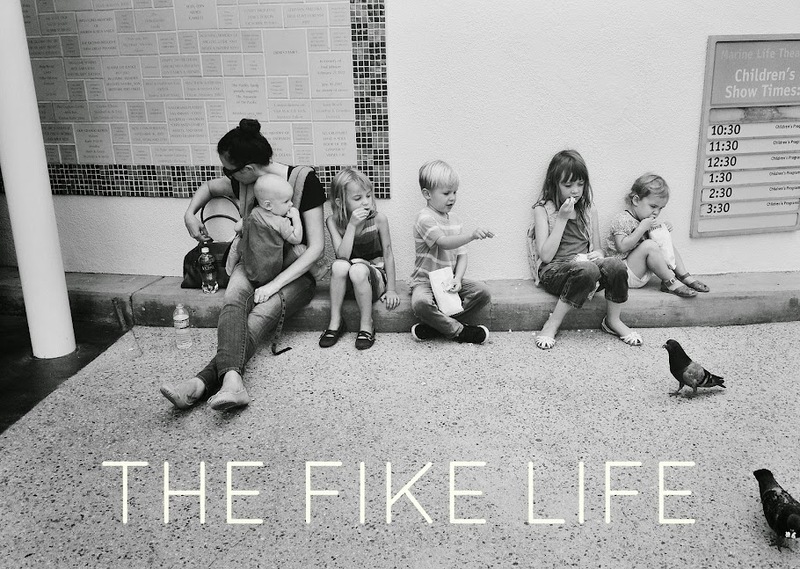 The Fike Life: Kendra! and a vlog intro in which I CLEARLY prove how good I am at vlogging. Kendra! and a vlog intro in which I CLEARLY prove how good I am at vlogging. So, yesterday I filmed a little video introduction. Meanwhile, Kendra wrote this. It's amazing. She freakinnnng DROPPED THE MIC on the Soul Pancake comments section. Stop what you're doing and go read it. If you already read it, go share it. She straight did the damn thing. I love my friendship with Kendra. I feel like her schleppy little sister. She is always inspiring me and giving me new, great ideas about kid-raising and home-making and party-throwing and etc. She is witty and thoughtful and writes super smart and important posts. I love her. I steal lots of her household rules and recipes. I hope at least two of my children marry hers. Her husband approached mine one day after mass because we were the only two families in the church with kids. We went over for dinner that night and have been fast friends ever since. And everything you assume about her (that is positive) is true. She works hard, she sacrifices lots, she is the smiliest. I'm often at her house, eating her food, forgetting diapers and stealing hers, leaving my kid's clothing and shoes behind, forgetting to RSVP to things. She is gracious. She keeps giving me diapers and food and real life sweetness and internet sweetness and she even gave me a godson. Please- go read her blog. And then come back here and watch this SCHLEPPY intro video. And laugh. She was writing that. I was filming this. Over a bowl of split pea soup. Vlog 1 from Kirby & Blythe Fike on Vimeo. This really sets a new level for vlogging. I like when the camera fell. Especially the second time. You're the best! This is the third time I'm commenting on your blog today so things are getting WEIRD. But I just love you! Your clumsiness with your phone almost rivals mine, but not QUITE. I only saw two comments! Where's the third? Where is it?? Oh my gosh! This was the BEST! Next time I'm in SoCal. Do people down there actually call it SoCal? Or So Cal? No? Hi Blythe. I saw your video after both Haley and Kendra posted about it. You are ADORABLE! Love love love the awkward realness. Gosh, I hope that didn't sound weird. Loved your intro here and the SoulPancake video. New creeper follower alert. Ok, so is Filmore an enclave of orthodox, homeschooling, chicken having, baby making Catholics? If so, what are the housing prices and taxes like? (Oops) prices are pretty great, comparatively. I have NEVER v-logged but you may have just upped my inspirations from a definite heck no to a okay this could be awesome. I'm new here, so hello! I came from Hallie's blog I LOVE your blog and your Soul Pancake video and your vlog! :) haha! You are charming and beautiful and a wonderful face of Catholicism for the world! Wow. Thank you, Mary! Although I seriously hope I'm not the face of Catholicism for the world. That's a terrifying prospect. Ha! Hello! Another new follower here, I came over from Hallie's blog. You're an inspiration to me, as a mama of two. I'm looking forward to reading more of your posts! :) Also, I recognized Hope in the Soul Pancake video--I've never met her, but am an avid Soul Gardening reader! Thank you so much for posting the vlog as is. I would rather see the real you in take 1 than who you think we'd want to see in take 7. I don't usually watch videos but I watched yours and I loved it! So cute, "just a bunch of friends that mommy has on the internet." That made me smile. Hi, I came over here from Grace's blog. I am an evangelical protestant but have been reading catholic mom blogs for a few years now. I love the strong moral stance you all take on ethical issues. Something that I've found lacking in my protestant circles. You all seem so serious about your faith making it your lifestyle. Which is the way it should be! I take my faith very seriously and do my best to live it out too! :-) Anyway, what drew you to Catholicism? I have read a bit on catholic theology and am surprised whenever I hear of an evangelical making the jump into Catholicism. WHY IS NO ONE TALKING ABOUT HOW AMAZING YOUR HAIR IS???? Sheesh, it's like...they're not all shallow. And weird. And insominiaish. Like I am. Ha! Ok, and cray. I have terrible hair!! I love this blog, particularly this post and the fact that you just let it be, unedited. You always remind me that being imperfect and sometimes messy is part of being human, and that at the end of the day just loving as much as you can is what matters. (I hope that sounds how I want it to sound.) you are inspiring. I found your blog from Kendra's. Love it! Your family is darling. And now I want to move to LA to hang out with both of you. Which is not at all creepy. You have a lovely fam! I always think of californians - can i say that? as not having big families - but I should not make that assumption. Anyway, dumb question, but what kind of cars do you all drive with such large families? I have 5 kiddos as well, which makes our suv full at this point! Hey! We drive an odyssey but we are maxed out! We know some peeps with big gmc type vans and some with sprinters. still live me that he did not know what happen to him that he left me.